Investing in a good set of patio furniture allows you to expand the living space of your home. However, furniture and fabrics that are exposed to the elements outdoors require more cleaning, maintenance and care than most indoor furnishings. Quality patio furniture can be expensive, so it's worth the time and effort spent to clean and preserve your outdoor furnishings. It's important to use the appropriate cleaning techniques and products that work the best for different types of patio furniture. The following cleaning recommendations are based on the type of material being cleaned. Always remove cushions, which must be cleaned separately, before beginning. One of the easiest types of patio furniture to clean is plastic furniture. Plastic outdoor furniture can be cleaned relatively easily with a few ordinary household products. In a plastic bucket, mix a solution of 1/4 cup liquid dish soap and 1 gallon of warm water. 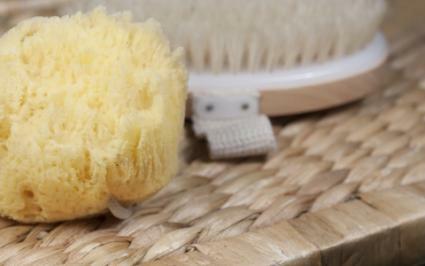 Use a large sponge to thoroughly wipe down the furniture with the soap mixture. Use a stiff brush to clean cracks and crevices. Allow the soapy water to remain on the furniture for 10 to 15 minutes. Rinse well with a garden hose. Wearing eye protection and vinyl gloves, mix a solution of 3/4 cup soda ash (sodium carbonate) and 1 gallon of warm water. Apply the solution to the furniture with a rag or sponge, covering generously. Allow the solution to sit for 15-30 minutes. Mix a solution of oxygen bleach and hot water according to the manufacturer's instructions. Allow the solution to sit for five minutes until totally dissolved and activated for cleaning. Apply the solution to the wood furniture using a rag, sponge, spray bottle or pumped sprayer. Let the solution sit for 10 to 15 minutes. Use a stiff brush to scrub the surface of the wood. Rinse thoroughly with clean water. Do not use a pressure sprayer, as it can damage the wood. Allow the wood to dry thoroughly. Sand wood furniture using medium grit aluminum oxide sandpaper. Seal the wood using a pigmented, water based synthetic sealer. Do not use oxygen bleach on redwood furniture, as it will darken the color of the wood. Use oxalic acid on redwood surfaces. Wicker furniture tends to be less labor intensive to clean than traditional wood furniture. Start by using an upholstery attachment on your vacuum hose to vacuum your wicker furniture. Mix a mild solution using 1/4 cup dish soap and 1 gallon of warm water. Gently clean the furniture with a sponge or rag. Use clear water and a clean sponge or a rag to rinse the furniture. Avoid soaking the wicker in too much water. Wrought iron patio furniture can be cleaned much like plastic patio furniture. However, if the surface gets damaged with rust, it may need to be refinished. Mix a solution of mild dish soap and warm water, using the same ratio as plastic or wicker furniture. Use a sponge or rag to clean the furniture. A stiff brush can also be used if needed. Rinse thoroughly with a garden hose. Remove rust by sanding the surface with medium to fine grit sandpaper. 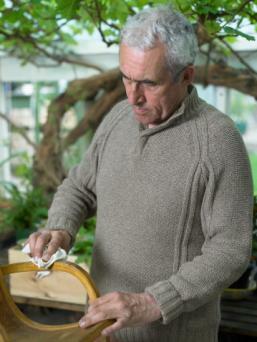 Use a soft cloth to remove the loose debris from sanding. Apply primer according to the manufacturer's instructions. Apply 1 to 2 thin coats of paint. 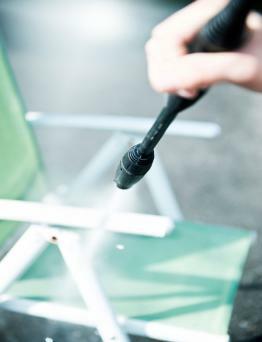 Routine cleaning is vital if you want to preserve the look of your patio furniture cushions. By following the cleaning tips below you will be able to prolong the life of your patio furniture cushions for years to come. Cushions with removable covers are easy to maintain with regular machine washings 2-3 times a year. Place in washing machine and wash on gentle cycle. Allow covers to air dry by laying them on a flat surface. Cushions that don't have removable covers will need a yearly hand washing. Mix a solution of 1 part dish soap, 1 part Borax and 1 quart of warm water. Fill a spray bottle with the cleaning solution. Apply a generous amount of cleaner to cushion covers, especially in creases and on stains. Allow the cleaning solution to sit for about 15 minutes. Rinse thoroughly with garden hose sprayer. Stand cushions on their sides to dry. Cushion covers made from canvas are durable. However, they take extra effort to clean if they can't be removed for machine washing. Rub a stiff brush back and forth across a bar of Fels-Naptha laundry soap. Scrub the canvas cushion, reloading the brush with soap when needed. Rinse well with sprayer on garden hose. Stand cushions on end to dry. Consider spraying the cushions with a fabric protector, such as Scotch Guard, prior to using them. Doing so will help protect them from the elements and make them easier to clean in the future. One of the best ways to keep your patio furniture from getting dirty is to place a tarp over it when it is not in use. This is especially important if you live in a region that sees a lot of rain and snow. Finally, before cleaning any type of outdoor furniture, it's a good idea to check the manufacturer's label for washing instructions. If your furniture didn't come with a cleaning label, then always test a small piece of the furniture for colorfastness prior to applying cleaning solution to the entire piece.